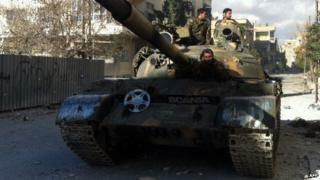 Syrian government forces are reported to have taken control of the motorway linking Damascus with the city of Homs. The road has been closed for several weeks because of heavy fighting with rebels in the Qalamoun mountains, which run along the border with Lebanon. The army is also said to have captured most of Nabak, a town next to the road, 80km (50 miles) north of the capital. Over the weekend, opposition activists accused government forces of carrying out atrocities against families there. The Syrian Observatory for Human Rights, a UK-based activist group, reported that five children had been shot dead in an industrial area. Photographs purportedly showing bloodied corpses were posted online. Troops backed by pro-government militiamen and members of the militant Lebanese Shia Islamist movement Hezbollah launched an offensive in mid-November to oust rebel fighters from the Qalamoun mountains and cut off their cross-border supply routes. The army has already seized the towns of Qara and Deir Attiya, both along the Damascus-Homs motorway, but fighting around Nabak blocked the key road for about 20 days, restricting fuel deliveries to the capital. On Monday, the Syrian Observatory reported that government forces had managed to regain control of the motorway, but that it was not yet safe. The pro-government newspaper, al-Watan, said the army expected to reopen the road "within a short time", adding that it had "extended full control over Nabak". It also quoted a military source as saying 100 rebel fighters had been killed or captured. However, opposition activists disputed the claim, saying the rebels still held part of the town and that fighting was continuing. The nearby motorway serves as the main link between Damascus and the north, as well as government strongholds along the Mediterranean coast. It will also be crucial for the transportation of Syria's chemical weapons to ports from where they will be loaded on to ships. Norway and Denmark have offered merchant vessels to help transport the chemicals abroad, while the US will provide a vessel on which they can be destroyed at sea. On Monday, the head of the Organisation for the Prohibition of Chemical Weapons (OPCW), which is leading the mission to destroy the stockpile, warned that it would be "quite difficult to meet" the 31 December deadline for transporting the most toxic chemicals out of the country. "This is very challenging, especially in view of the security situation, which is worsening in this country," Ahmet Uzumcu told reporters in Oslo, a day before he will collect the Nobel Peace Prize on behalf of the OPCW. Mr Uzumcu also said there was "quite an ambitious timeline" to get less-toxic chemicals out of Syria by 5 February, adding that "there might be a few days' delay". But he was still confident that all of Syria's chemical weapons would be destroyed on time, by the middle of 2014. In a separate development on Monday, the Syrian Observatory reported that jihadist rebels from the al-Qaeda affiliated Islamic State of Iraq and the Levant (ISIS) executed a man in the northern province of Idlib after accusing him of blasphemy. The diesel merchant, who suffered from a mental illness, was arrested after jokingly asking the ISIS fighters if they thought he was "the god of fuel" when they complained that there were impurities in his supplies, the activist group said. The UN also said that a mass campaign to vaccinate some 23 million children against polio in the Middle East was starting this week. It said the programme is a vital response to an outbreak of polio in Syria, where 17 cases have been detected. The aim is to reach more than 2 million Syrian children, particularly those in contested areas.